The past week was quite packed with events. CERN TH hosted a workshop on Monte Carlo tools but, since I'm opposed to gambling, I'm not going to cover it here. The cherry on the top was the series of lectures on warped extra dimensions delivered by the better half of Randall-Sundrum. Undeniably, Lisa Randall is one of a handful of particle physicists enjoying a celebrity status. She is of course famous for giving us RS-1, the second best cited paper in the history of particle theory. On the popular science front, she has her own book that proves her good taste for music and bad taste for poetry. She even made it into the shiny world of American TV shows. Back to our small world, her seminars invariably create a lot of stir-up. Her previous performance at CERN sent shudders through the blogosphere, leading to several broken friendships and one auto-da-fe. Personally, I don't like being burnt alive, so I'd better be ending this general introduction and jump into the safety of physics blogging. The RS model is the last truely original and noteworthy idea spawned by particle theory so far. Introducing a warped 5th dimension allows us to accommodate, in a consistent and natural way, vastly different scales in one theory. By AdS/CFT, the fifth dimension can be viewed as an effective weakly coupled description of some strongly interacting hidden sector. Although possible uses of the RS framework are much wider, most of the current work is focused on applications to the TeV-scale physics. In this way, the large hierarchy between the Planck scale and the electroweak scale can be understood as a manifestation of the warped fifth dimension. The industry has produced many constructions based on the RS paradigm. Currently, the most interesting version seems to be the one with the higgs field and the third generation fermions localized close the IR brane, while the light SM fermions are localized close to the UV brane (SM gauge fields are evenly smeared along the fifth dimension). If the higgs field lives close to the IR brane, it feels the effective cut-off scale of order TeV, so that the quantum corrections to its mass are not sensitive to the Planck scale. Furthermore, one can implement dynamical electroweak symmetry breaking by making the higgs field a part of a 5D gauge field. Finally, by localizing the light fermions away from the IR brane, one can explain the fermion mass hierarchies and the CKM mixing angles. Thus, this version of RS models can address both electroweak symmetry breaking and flavour physics. 1. The KK graviton, a spin-2 particle with large couplings (TeV suppressed, instead of Planck suppressed as for the massless graviton) is often consider the hallmark of the RS scenario. However, the prospects of seeing it at the LHC are not that bright. One reason is that the KK graviton is sharply localized close to the IR brane and it has suppressed couplings to the light quarks localized in UV. 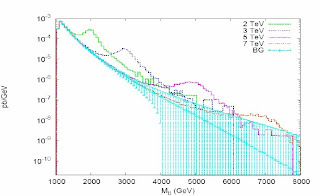 All in all, the discovery reach for the KK graviton extends only up to the mass of 2 TeV. 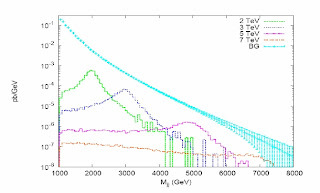 Such a small mass is rather unlikely; the KK graviton is by a factor 1.5 heavier than the lightest KK modes of the SM gauge bosons, and typical constraints on the masses of the latter are around 3 TeV. 2. Black holes are even more spectacular, but the chances of spotting one at the LHC are inversely proportional to their spectacularity. See this old Tommaso's post for a wrap-up. 3. KK gluons provide a much more promising opportunity for a discovery. The LHC production cross-section of these heavy partners of the QCD gluon turns out to be larger than that of the KK gravition. The KK gluon interacts most strongly with fermions localized in IR, thus it will decay dominantly into a pair of top quarks. This should be visible as a peak over the SM top pair production, see the left figure. The discovery reach, however, crucially depends on how well we can identify top quark jets at the LHC. If the efficiency is not good enough, the KK gluon signal can be easily swamped by the light quark jet background, see the right figure. 4. Flavour physics appears interesting too. The RS framework leads to the scenario called next-to-minimal flavour violation (one of these names invented in a stroke of imagination) in which flavour violating interactions occur via mixing of the light quarks with the third generation. Although the RS set-up contains severak new TeV particles, their flavour non-universal couplings are aligned with the CKM matrix structure, and the corrections to most low energy flavour observables are under control. Yet some observables, like $\epsilon_K$ in the kaon mixing, generically come out too large, which suggests that some flavour symmetries should be implemented in the RS model. No compelling model has emerged so far, yet the generic feature that we expect are large flavour-changing neutral current in the third generation showing up, for example, in the top quark decays into the charm quark. All three lectures are available for everyone to admire. thank you and thank you for the links. From the traffic I receive, I gather that your blog has become very popular. That is no surprise, since your posts are always exceedingly interesting. Jester, I would just like to congratulate you on not saying anything demeaning about Lisa Randall or how she was dressed.